Gay Ad Network delivers the highly desirable gay and lesbian audience across a curated network of brand-safe LGBT digital media properties. Gay Ad Network is the preferred gay media partner for the world’s largest brands, buyers and advertising agencies. 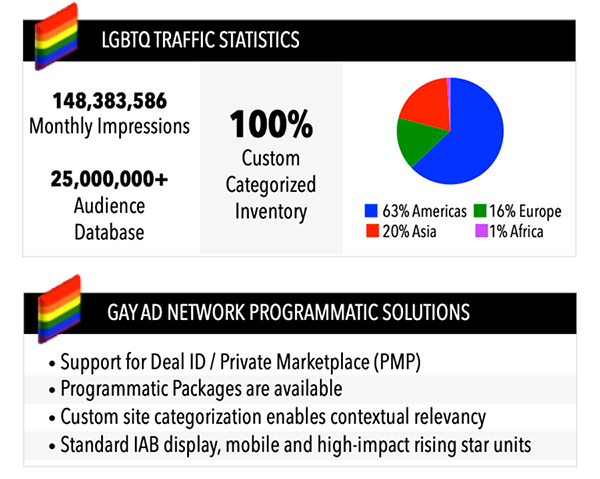 Our programmatic marketplace is the first and only LGBT marketplace to offer access to premium LGBT content in real-time with the ability to build customized gay audience segments for advanced targeting across display, video and mobile inventory sources. All inventory placements are audited by Gay Ad Network and Appnexus. We only represent owned and operated and directly managed LGBT inventory. We provide white lists and site categorization to enable contextual relevancy. All placements are fully transparent to improve targeting and optimization of campaigns. To start buying on Gay Ad Network, target our Appnexus Member ID: 1773. If you require a whitelist, Contact Us. Establish a Deal ID to control floor price and buying terms. We can overlay our first party and third-party audience segments to create custom targeting lists. Besides standard IAB display, mobile and high-impact rising star units are available. To establish a Gay Ad Network Private Marketplace program, Contact Us.